THE TRUMP CARD, my monologue about Donald Trump and all he contains in this particular American moment, is available for download as an edited theatrical transcript under and open performance license so that anyone, anywhere can perform and give readings of it. Q: When can I download a script to THE TRUMP CARD? Q: How do we get permission to do a reading of the show? A: You don’t. You already have permission. Q: How do we get permission to do a production of the show? Q: How much do we have to pay in royalties to do this? A: There is no catch. It’s open sourced. Q: Can I cut the script? Can I make changes? Q: Are theaters really doing the show? A: Based just on talking about this in interviews, I’ve had inquiries from a dozen theaters so far. And AGONY/ECSTASY, which I released the same way, has had almost 200 productions (that I know of) all over the world. Q: What materials will you give us to do the show? A: A script of the show so that others can perform it, advice, images, a soundtrack suitable for your production if desired, and if you tell me about your productions some degree of social media promotion. Q: What do you get out of doing this? A: Nothing. Except I believe this is a unique election in my lifetime, and a unique candidate, and I wanted to give other artists an opportunity to build their own productions with these blueprints. Download The Trump Card script here. 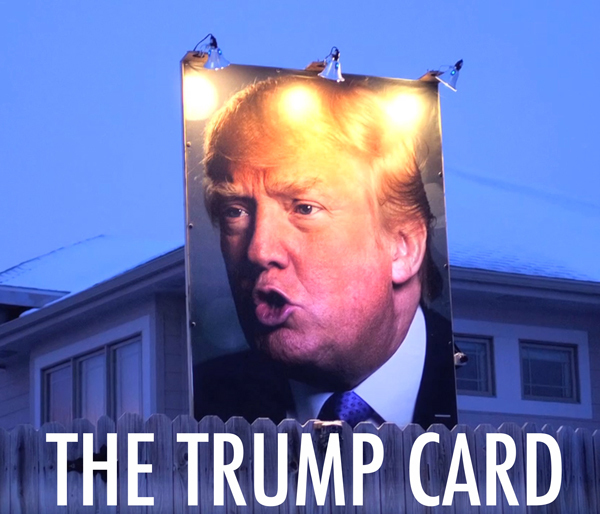 Download an image of a homemade billboard of Donald Trump in Iowa here. Download that same image with a title treatment for the show here. Download a soundtrack for The Trump Card here.